Few people realise that in addition to compromised aesthetics, gaps left when teeth are lost can cause drifting and tilting of adjacent teeth, which in turn can lead to decay, gum disease, and jaw problems. Tooth loss can also cause shrinkage of the jaw bone, leading to a prematurely aged appearance. The loss of a tooth, therefore, has both aesthetic and functional consequences. There are a number of methods by which lost teeth can be replaced, including dentures, bridges and dental implants. Dental implants are widely recognised as an excellent method of tooth replacement. 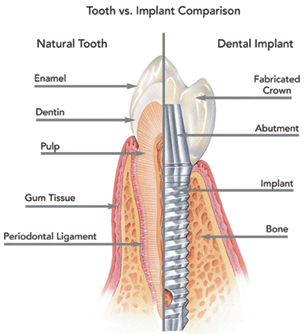 Dental implants are metal cylinders made of titanium surgically placed in the jawbone where teeth are missing. They replace the roots of missing teeth and support single crowns, large bridges and dentures. State-of-the-art technology makes it possible for these replacement teeth to look, feel and function like natural teeth. If you are missing one or more teeth, have dentures, a restoration supported by a dental implant and/or implants is an option you must consider. In many instances it provides the best alternative for care. Several benefits exist to receiving dental implants. They are fixed solidly in the bone and allow teeth to be replaced in a manner that is closest to natural teeth. They have a long history of good success. However, dental implants require surgical procedures that usually include a small amount of discomfort and the time it takes for the implant to heal in the bone which can be a few months. Because a dental implant requires both surgery and then making a replacement tooth that attaches to the implant, it is usually more expensive than a bridge when replacing a missing tooth. Dental implant treatment needs careful planning and someone with advanced training to make your treatment a success. It varies from individual to individual and with health and habits. For a healthy individual with good oral hygiene and good health, dental implants are predictably successful and survival rates above 90-95 percent are reported. You may consider seeking the care of a Prosthodontist, who is a dental specialist with three years of additional education after dental school, and who is trained to serve patients with a combination of needs including dental implants. Unlike natural teeth dental implants are not susceptible to dental disease such as decay; however, the health of the gums is vital to maintaining last implant success. Conscientious home care by the patient and regular professional cleanings and check-ups are essential elements for dental implant sustainability. Each patient is different, and success relies upon diagnosis and planning, medical history and a variety of other factors. All on four is a process by which all of the teeth are replaced in one jaw by using four implants. This process can be less expensive than the previous process that used five or six implants. Dentures cannot be “made into implants.” Implants are metal screws placed into the jawbone to help anchor and support artificial teeth (dentures). It may be possible to have implants placed beneath existing dentures to aid in the stabilisation and support for those dentures. This could only be done if the current dentures were otherwise in excellent condition and relatively recently made. You should consult the dentist or Prosthodontist who made the original dentures. What is the cost for implants? The cost will vary by patient. A Prosthodontist will make an assessment based on your unique needs. Often the costs a Prosthodontist charges are no more than what you would pay at a general dentist. To find out what your treatment would cost, please call us to come in for a consultation. It is possible for implants to have an infection that requires their removal. Implants can be safely removed and many times a bone graft is placed where the implant used to be. Make sure the implant dentist you are seeing is a dental specialist such as a Prosthodontist, Periodontist or an Oral Surgeon for the best treatment available. All of these are recognised specialties of the New Zealand Association and have 3-5 years of advanced training beyond the five years of dental school. My #16 molar is beyond repair; I want to get an implant but I cannot afford an implant. Does a partial denture prevent shifting and additional tooth loss? The dentist said I have healthy gums and the tooth below also touches another upper tooth. A partial denture will prevent shifting of teeth but is rarely used to replace just one back tooth. If you are missing more upper teeth, then a partial may be a good investment. Many times tooth #16 is not replaced since you will still be able to eat and chew. Also, the lower tooth touches another tooth so it is unlikely to move. Why don’t more dentist tell patients about jaw bone loss and facial collapse before exacting teeth and replacing with dentures? Shouldn’t patients be aware that this will happen and there will come a day when they can’t even wear dentures any more? There are a lot of consequences to losing teeth and wearing dentures. Many times there has already been a lot of bone loss due to periodontal (gum) disease and there may not be options to save the teeth. Dental implants can help prevent further bone loss in addition to supporting dentures. Ask a Prosthodontist what is the best option for you.